Let's talk about wearing dresses. 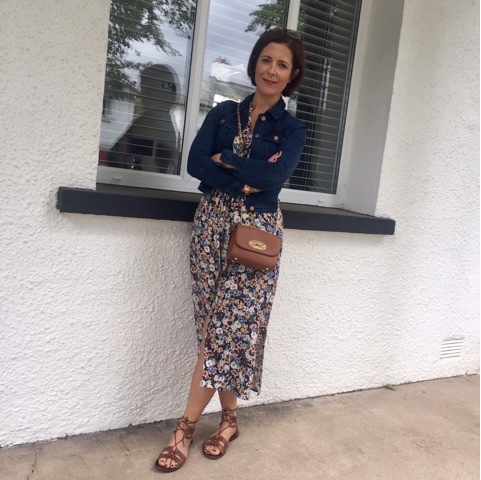 If you follow me on Instagram, you'll have seen my collection growing by the week in my usual 'behind the curve' style but I think the reason I was slow to embrace the trend and possibly why so many women tend to avoid dresses, is that I didn't want to look too 'dressed up' in my casual daily environment. I think it was connecting trainers with a dress that won me around but even at that, I had to wear the look a few times before I felt fully comfortable. I urge you, as I do with all trends - get an inexpensive starter item and give it a go. Sometimes you just have to get used to yourself in the mirror with a different silhouette/proportions. I can guarantee you the compliments will flow because there's not a woman out there who doesn't look better in a well fitting dress. 1. Opt for a dark print. 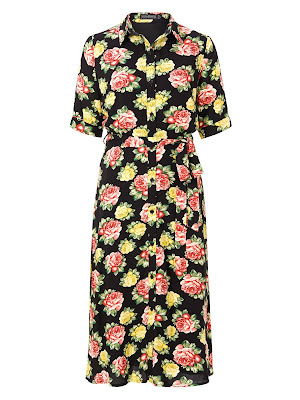 This will ensure you don't feel too 'out there' on your first frock foray. Also, smaller prints will look less showy and will be less memorable than a large pattern. 2. 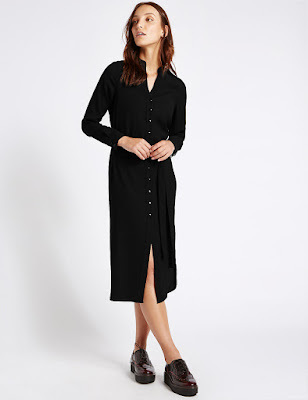 Start with a shirt dress with buttons down the front. 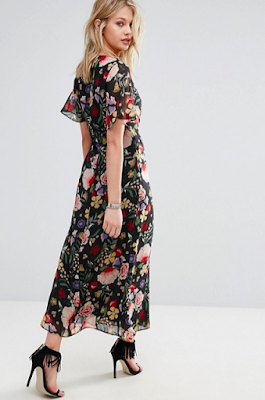 This is the most casual style of dress and one that can be worn in lots of different ways, including over your skinnies kimono style, if you decide the dress trend isn't for you. I've shared a few suggestions down at the bottom of this post. 3. Keep your shoes and jacket casual - a dress is just that...dressy. So off-set this formality with some informality, be it a denim jacket, trainers or some flat sandals. 4. 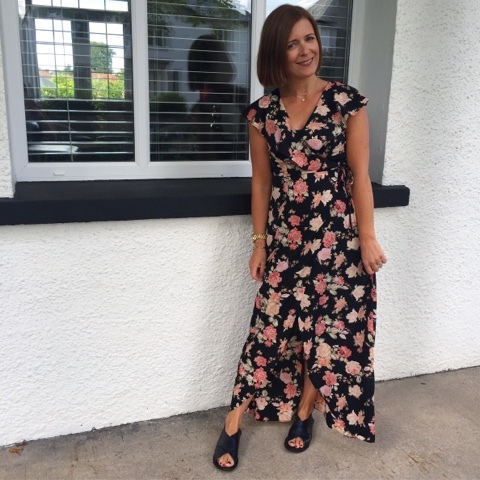 Opt for a midi length - much easier to wear than maxi and less of a faff with car doors, steps and puddles. Overall, I prefer a longer midi - something below mid-calf but the best length will depend on your height & footwear choices. Don't let the length put you off though because ⬇️ point 5! 5. Your tailor is your friend. Dresses are generally easy and inexpensive to shorten so don't be held back by your height. If you love a dress but it feels a bit long, know that it can so easily be shortened to the length that perfectly suits you. 6. Get your jacket length right. A dress generally suits a shorter fitting jacket, ideally one that nips at the waistline of the dress. I invested in new denim and biker jackets that sit much higher on my top half than any others I own. But this allows you to extend the wearing season of your dresses beyond summer. 7. Find a great pair of trainers. My Adidas Stan Smith trainers are probably the most widely available, neutral, dress-approporitate trainers that I own. I recommend the plain white but you tend to get offers on the ones with a colour on the trim. I wear the boys size 5.5 - cheaper than the ladies ones! 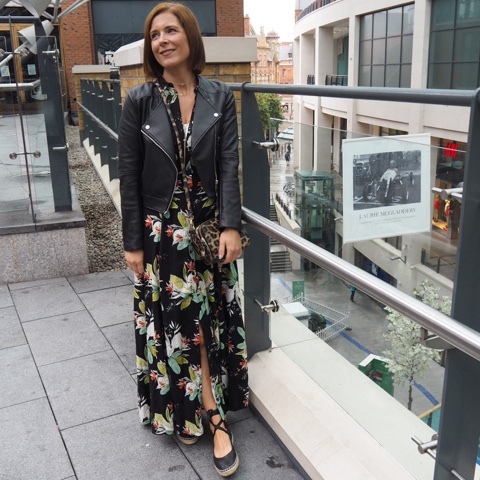 So before I show you some great dresses available online, here are 4 (eek) of my recent dress purchases, starting with a Marks and Spencer sale steal from Per Una - I know, PER UNA!? Which is why it was probably in the sale. If it had been in the Limited Collection, I think it would have been snapped up super fast. 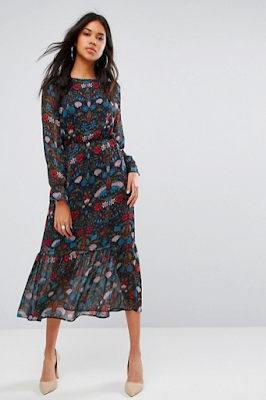 I ended up buying the 14 in this dress as I loved it so much and it was the only one left but it must be fairly neat fitting (or I put on more than 5kg since April) as it fits me fine. 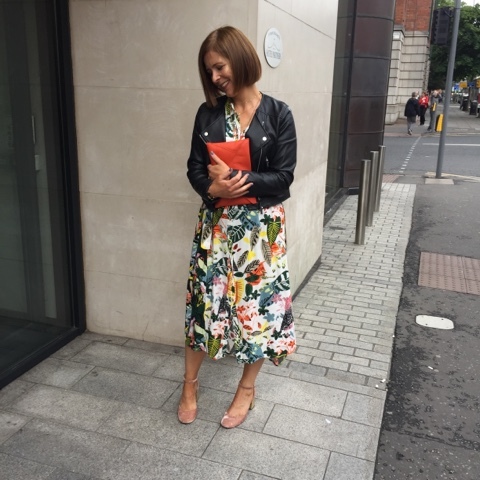 Here I am wearing it on a night to the theatre with my blogging friend Emer D.
The next one is from TK Maxx and was only £14.99. It's a bit of a nightmare to wear from an indecent exposure point of view and so I wear a slip underneath. Love the print and the wrap style. 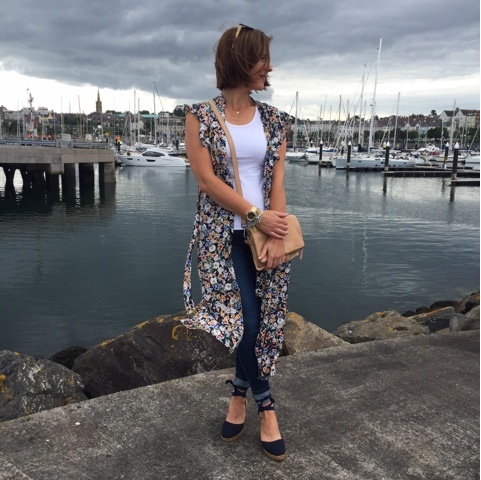 I've worn this one with a denim jacket and the biker and it works really well with both. Sandals - Warehouse - now on SALE! Finally, this Zara sale find has proved to be a hard worker. I bought it without trying on and was full sure I'd have to return but the colours are great and it fits perfectly. As all of mine are frustratingly out of stock, here are a few that are in stock online at the moment. 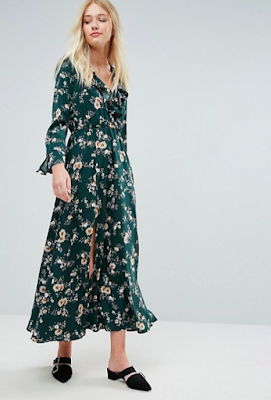 And never fret about buying dresses at this stage in the year because they will all work with ankle boots in autumn. The first few aren't shirt style, but I adore the prints. Scroll down for a few button down ones. Don't be put off by the open back on this first one. Simply wear a vest underneath it. 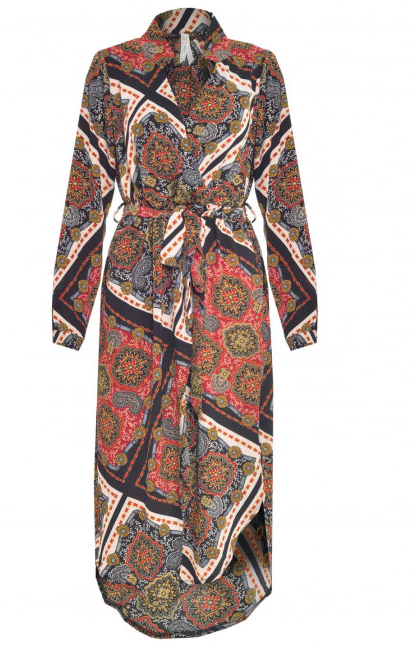 The print is stunning and it's only £10. There are no size 10's left so I've ordered a 12 to see what it's like and I'll report back. 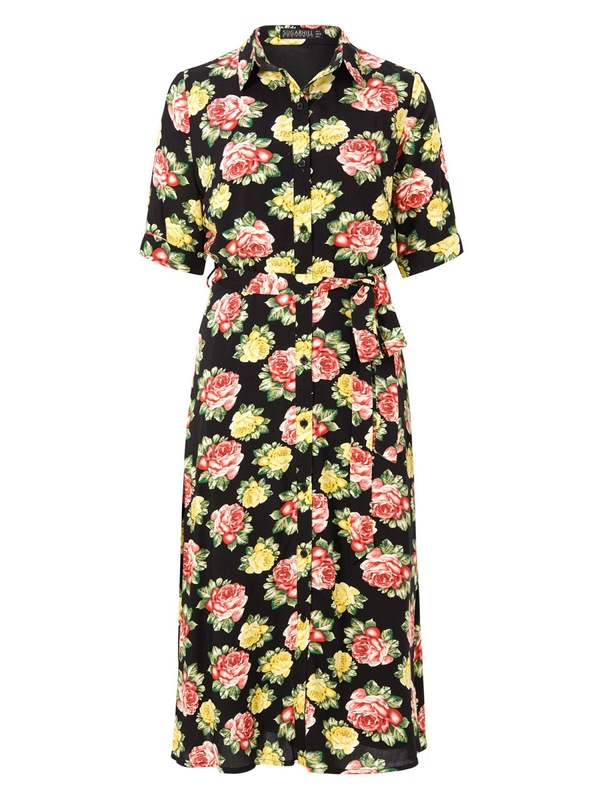 This Boden one is firmly on my wish list - it's pricy but absolutely stunning. Thinking about having a Boden party this year but I'm unsure if their prices are generally getting a bit too high? Sugarhill Boutique at House of Fraser here and finally, it's one with buttons down the front so it would be perfect worn kimono style too! Hope you're having a fab weekend....I'm packing for a trade show in Dublin and guess what's in my bag? Dresses - 4 of them. There's another reason why they are amazing....one item on and you're dressed! Boden prices are definitely going up season by season, I winced when I saw some of the recent prices (well earlier on this year in Preview) particularly for dresses. Love all of them! You have inspired me to dress up :-)!! Oh dear, I am a dress wearer and I love every one you have featured 😳.